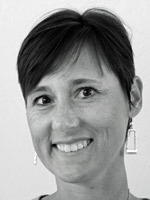 I am still stunned and saddened by Laurie’s bad news. I really urge you to help me to shower her family with cards and prayers. I am wishing you a Happy, fun and safe Halloween. May your kids (and you) get lots of their favorite candy and NO stomach ache. The card base is a 4 1/4″ x 5 1/2″ piece of Basic Black cardstock folded in half. It is layered with a 4″ x 5 1/4″ piece of distressed (Cutter Kit) Whisper White cardstock followed by a 1/4″ smaller piece of distressed and paper pierced Haiku Designer Paper. The distressed Kiwi Kiss Pattern Designer Paper measures 2 3/4″ x 4″ and is layered on a 1/4″ bigger piece of Basic Black. I should have made it at least a 1/4 shorter, but I wasn’t thinking about the additional white border I would be adding later. The top and bottom of the layers were punched with the Spiral Punch, the side layers were paper pierced. I sanded over the Designer paper with my sanding block to distress this layer even further. Next I took two 3″ strips of Whisper White cardstock, held my 1/4″ square punch diagonal to the paper and punched my zigzag border. I just couldn’t see scallop borders there working for a Halloween card. I taped the border on the top and bottom of my Designer paper layers. Now the white was showing through my spiral punch. I didn’t like that so I covered each of those squares with a black brad. So much better! Next I tied Tangerine Grosgrain ribbon around both layers. 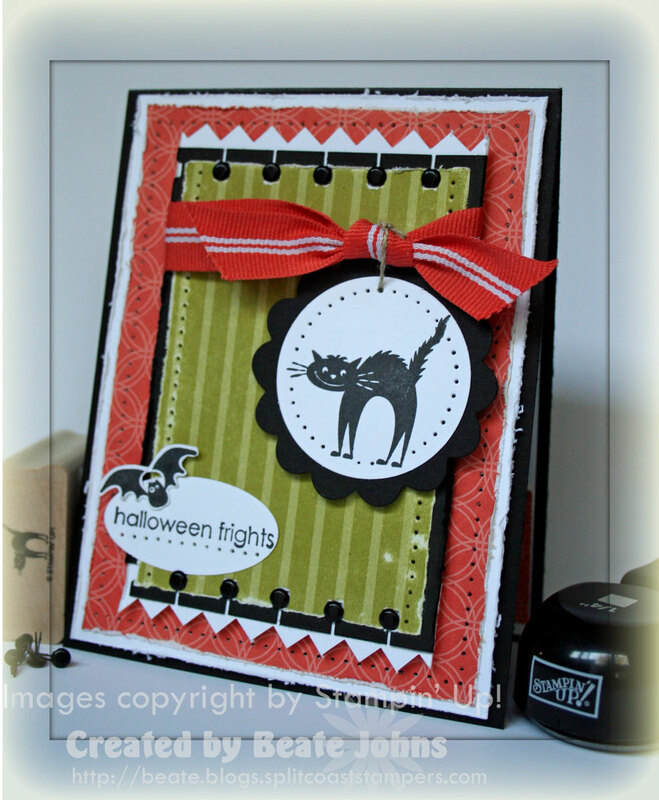 I stamped the cat from Halloween Frights in Black Stazon on Whisper White cardstock, punched it out with the 1 3/4″ circle punch and layered it on a black scallop circle cut with the Pennant Die. I paper pierced the edges fo the white layer, threaded Linen thread to the hole on the top and tied it to the ribbon. I also attached it with dimensionals to the front to keep it in place. I stamped the sentiment in Black Stazon on Whisper White cardstock, punched it out with the large oval punch, taped it to the lower left of the layers and paper pierced underneath the sentiment. I stamped the bat in Black, cut it out and mounted it with dimensionals on the top right of the sentiment. Love the use to the square & spiral punch!! The brads look great too and fun way to cover up the white! Happy Halloween! What an adorable card, Beate! I LOVE how you did the zig zags with that punch. . .too clever! Happy Halloween! I’ve posted mine. Thanks for the challenge. Ohhh AwESOME! Love your stitching! Mine is HERE – http://www.chrissyd723.blogspot.com Thank you for the challenge Beate! Have a great day! Wonderful Halloween card Beate~! Can’t wait to work on the sketch! I’m sorry to hear about Ali too….will be sending a card off today. Aren’t you a smarty pants with your zig zags…. Darling Halloween card! I prefer that to spooky! LOL! Have a wonderfully frightful Halloween! Hugs! Great card and challenge as usual. So very sorry to hear of Laurie’s daughter Ali. I would love to send a card if you could please forward her address to me. Happy Halloween! Love you card as usual! Please send me Laurie’s address so I can send them a card. Do you know what is wrong with her daughter? Thank you for being so thoughtful! You sent me a card earlier this year when my grandfather passed away and it meant so much to me. I still have the card because it is a Beate creation!! Cute! I like the zig zag border! Great card! I love the way you made the edge-thanks for sharing that cool technique! I’ll add them to my prayers. What a gorgeous card! So many awesome details and love the colors, I’m going to have to try this sketch out! Great card and sketch Beate!! 🙂 Happy Halloween and I will be sure to get a card off to Laurie!! I am too totally stunned about Laurie’s news. I’m going to keep her in my prayers. Stunning Halloween card, Beate! I really love your sketch this week and cannot wait to put it to good use, but I have to admit, this is going to be a tough act to follow! I love how you’ve used this stamp set and every little detail you’ve crammed in there! What an adorable card!! I love the layout and the colors a lot! My prayers are with Laurie and her daughter. I hope everything is okay and isn’t serious. I think I can find her address, but if not I’ll send you an e-mail. Here is my card for today’s sketch. It was fun, and I actually used Pixie Pink, I think for the first time ever. this is a very cute halloween card. your sketch is fantastic. Hope you had a great Haloween!!! Your Halloween card is adorable, its so clever how you made the zig zag edge! If I could please have Laurie’s address I would be more than happy to send a card. Thank you for sharing this information and gathering people to send cards. I can’t even image how Laurie and her family must feel, I’ll be sure to keep them in my prayers. This is a really fun card! I LOVE how you did the inside too! I never think of that, even tho “in the beginning” being taught to at least stamp a little accent in the corner…..
Just to let you know, because of you I bought that itty bitty square punch today 🙂 lol. Such the enabler you are, I love enablers! The sketch looks great I will play later this weekend. This is SUPER cute, Beate!! What a great take on your sketch!! I love it!! I am terribly saddened to hear Laurie’s news, and will be sending something along to her soon. (I have been having some family health issues as well…but nothing like that). I love the 1/4″ square punch technique. Awesome. Thanks for sharing this with us. This card is awesome!! I love all the details, everything about it! It’s going on my top favorites list! What a cute way to utilize that punch.. your cards are always so beautiful! I will pray for Laurie and family… so sad! Beate, your Halloween card couldn’t be cuter! 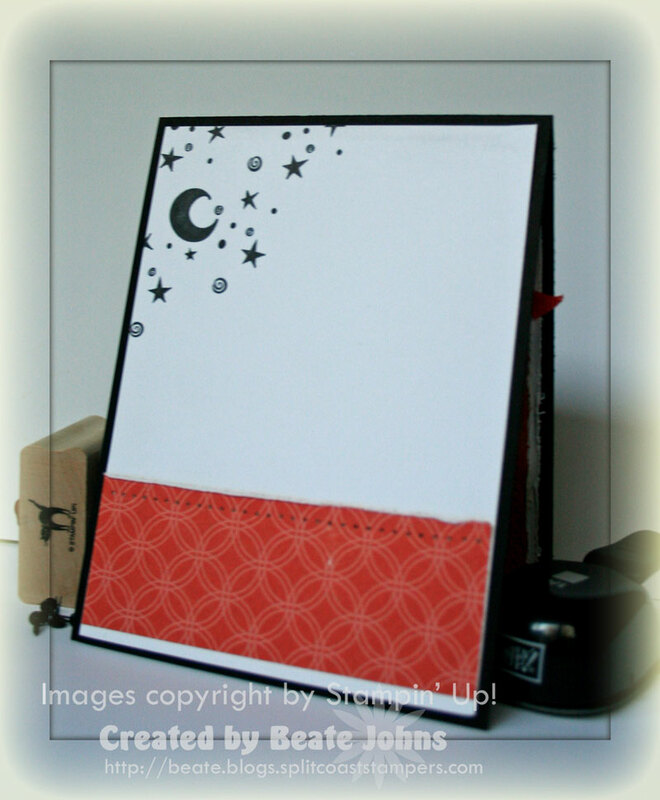 I love the border you created with the square punch … very clever! Great card Beate and a great sketch challenge too. I can’t wait to play, will upload my card later. Beate, this is so fresh, bright, and FUN–you ROCK! Fun card, neat idea with the zig zag border! Awesome card Beate! Great use of the punch…may have to give this a try soon. Thanks for another wonderful sketch. Love all your cool punch treatments, Beate — they really make this card special! Great color — love the hanging cat tag!